History behind this article is very funny, my friend need to calculate the hit count to his website, he was under stressed from last 3 days , finally i have told him to use Global.asax to accomplish task. So i thought to write an article over Global.asax, and now i get chance to serve you. This is optional file in ASP.NET, this file also known as ASP.NET application file. This file takes care of all application and session level events raised by ASP.NET or by HTTP modules. This file can be found in the root directory of an ASP.NET-based application. This is very secure, external users cannot download or view the code in it. This file exposes the application and session level events in ASP.NET. This is the gateway for all session and application event Global.asax file is the central point for ASP.NET applications. It provides numerous events to handle various application-wide tasks such as user authentication, application start up, and dealing with user sessions. 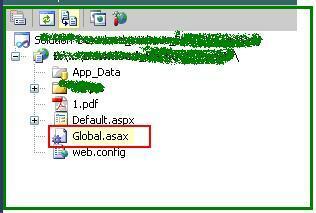 if Global.asax is not present in your solution explorer then you can add it by using Right click on projectname in solution explorer and select Add Item and select "Global application class"
Global.asax file derived from the HttpApplication class maintains a pool of HttpApplication objects and assign them to application on need basis. After initializes, Application_Start event get fired when instance of the HttpApplication class is created. This event get's called when the last instance of an HttpApplication class is destroyed. It is called only once during an application's lifetime. This evevnt used by application before it is destroyed. This is the ideal location for cleaning up previously used resources and objects if application throws unhandled exception. If we have not used TRY...CATCH in code then application handle this exception in this event, this event get called when unhandled exception occurred. This is event is user specific, which will fired when any new user opens webapplication, at same time new session ID is allocate to that user. This event called when session timeout is reached or session endup by calling Session.Abandon method. Now we will calculate website hit count with the help of global.asax, it's very simple. There are centain conditions where we can't use Try..Catch so how to show error and un handled exceptions. don't worry...Global.asax will help you. Application_OnEnd event and restarts the application domain. In effect, this will reboots the application by closing all browser sessions and flushing all state information. on the next request it compiles the Global.asax file and raises the Application_OnStart event to start the application. It's a Global application file that handles all application and session level events. With the help of this file we can keep all our sharable data in Application object and can use by other users. In next article we can elaborate Application object.